The Values Cards – powerful agents of change. Our values are what we hold as precious to us. They are a preference or an internal reference point for what we believe is good, right and important. They are like a compass that can keep us on course. They influence our attitudes and behaviour. They guide our approach to life and relationships. They inform our way forward through the many choices we are offered every day, as we react and interact with others and situations. Mostly we act in accordance with our values to maintain a sense of well-being. But often our values are compromised by circumstances or events and we do things that don’t feel right. When we do things that are at odds with our values, we feel uncomfortable. Living in a situation where it is a constant struggle to act according to our values can cause stress, anxiety and depression. The activities assist in uncovering core values and pose questions for contemplation and discussion. Each of the 53 values represented on the cards has been carefully chosen following testing in various settings. The words are deliberately open to individual interpretation to cover the broadest possible range of values within a user-friendly set of cards. We have also included 3 blank cards for any specific values that may arise but are not represented in the set. The Values Cards Downloads are printable PDF versions of the Instruction Book, The Values Cards themselves and various support materials such as recording and scoring sheets, especially useful in group settings. 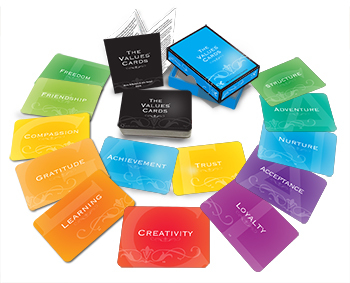 The Downloads are available free to purchasers of The Values Cards. If you have already purchased The Values Cards you can access the Values Cards Downloads for free. Just click on the “Add to cart” button below and proceed to the checkout. Click on the “Have a coupon?” at the top of the page and enter your 6 digit special passkey. Click “Apply Coupon”, Fill out your details, “Place order” and a link to the downloads will be emailed to you. Full set of 56 Values Cards (65x65mm) in colour – 5 x A4 sheets. Full set of 56 Values Cards (65x65mm) in black & white – 5 x A4 sheets. For durability, we recommend the 5 printed card sheets be laminated before cutting them out.